EXIF info - Aperture : ƒ/16 | Camera : Canon EOS 5D Mark II | Taken : 4 October, 2011 | Flash fired : yes | Focal length : 100mm | ISO : 100 | Location : 13° 4′ 2.1972″ N 74° 59′ 43.8828″ E | Shutter speed : 1/125s | Images and content Copyright © Krishna Mohan. Please contact me to purchase prints or for image publication license. 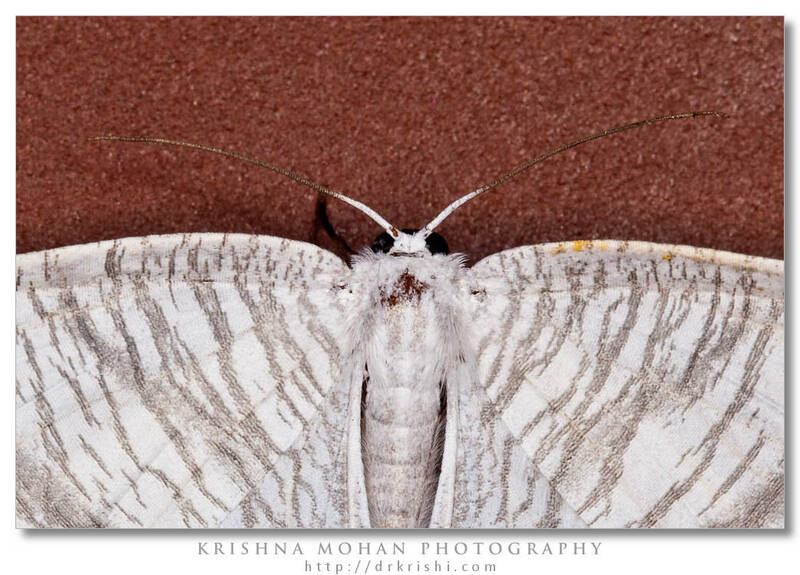 That night coming home for dinner I spotted this moth on our kitchen floor. Being a pretty common moth around my house I assumed that I will get lot of information about this white moth. It was sitting on the vitrified floor tile which I have used in my kitchen. Dark clay color of the tile was a great contrast to the white, grey moth. Unfortunately the profile picture of the moth was impossible to get as it was sitting as though it was firmly stuck to the tile. That is why you see the picture from one angle here. I used Canon EOS 5D mark II with Canon EF 100mm F2.8L USM Macro lens illuminated with Canon Speedlite 580EXII fitted with ExpoImaging Ray Flash Adapter. 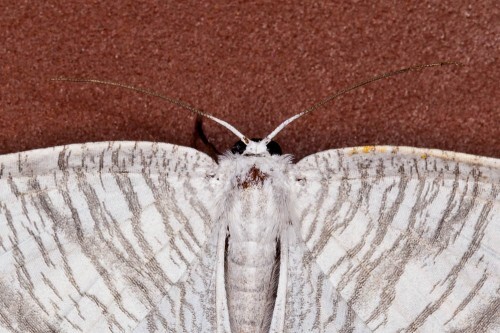 When I searched internet for the information about this moth, I drew blank. Even thoughit is so common we hardly know anything about it. This Micronia aculeata moth belongs to Uraniidae family of moths. 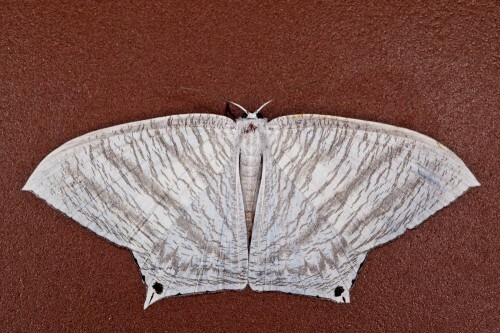 Unfortunately I could not find any common name for this moth. 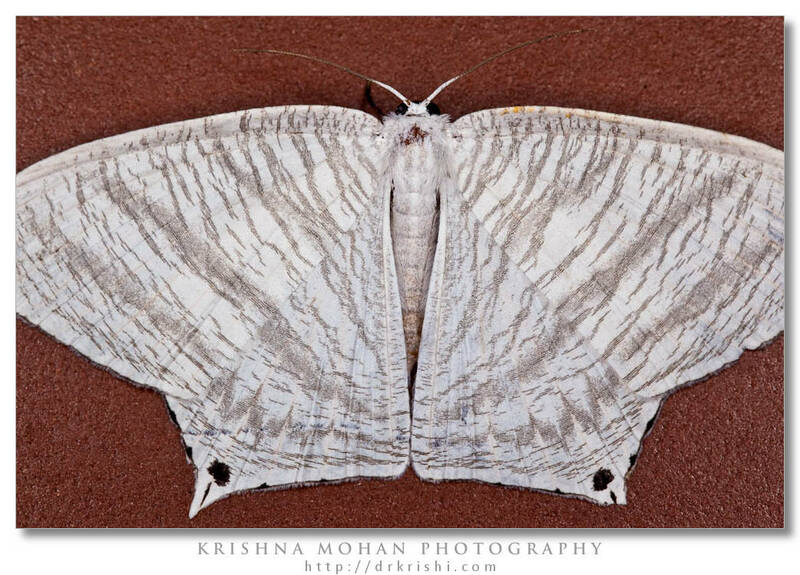 Some have called it Wayanad greystripe moth. It is found throughout India, China, Taiwan, SriLanka, Burma; Andaman, Java and Borneo. 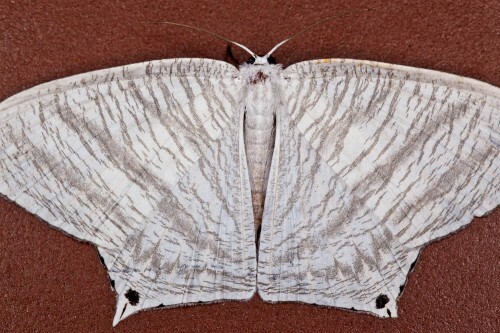 The adult moths of this species have speckled pale brown wings with two faint darker submarginal bands. Each forewing has a hooked apex, and at the tornus of each hindwing there is a short tail with a black spot. 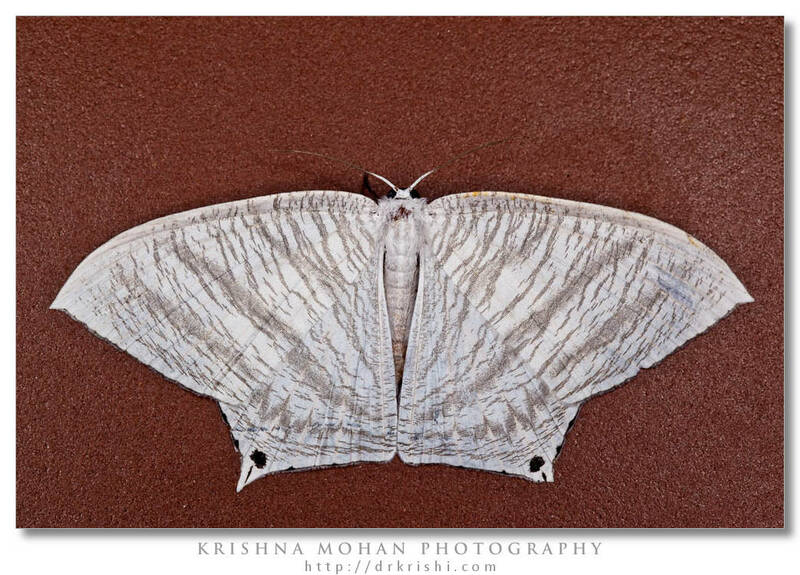 Like many moths in the family Uraniidae, the moth has its wings open and flat in its resting posture. It is also a day flying moth. Thanks to Haneesh K.M we have Life cycle of Micronia aculeata on Flickr. Host plant for its caterpillar is Green Milkweed Climber Wattakaka volubilis.